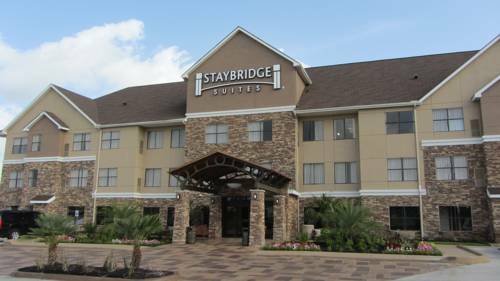 Welcome to the Staybridge Suites Houston NW Willowbrook. We are a Pet Friendly Hotel that offers a limited number of pet designated rooms. Hotel is conveniently located on Highway 249. Our hotel offers studios, one bedroom and two bedroom air conditioned suites, all with one king bed and a sofa sleeper and full kitchenette. Methodist Hospital, St. Lukes Hospital and Hermann Memorial Hospital are all within one mile of the hotel. Willowbrook Mall and Vintage Park Shopping Center offer unique shops and restaurants. Shuttle available within 3 miles on request. Bowling and golf nearby featuring PGA golf courses and Top Golf. Businesses near hotel: Hewlett Packard, GE Oil & Gas, Baker Hughes, National Oil Varco, Noble Energy, FMC and Canrig Nabors Drilling just to name a few. Catch up on work in our 24-hour Business Center with complimentary wireless Internet, printer, fax service and computers. The hotel has an outdoor pool and whirlpool, basketball court for your exercise needs and a great BBQ area to prepare grilled foods or just unwind and enjoy the outdoors. Every room stay includes complimentary full American breakfast daily and an evening reception Monday thru Wednesday offering beer, wine and great food. If you want to check out a movie or book come visit our den or sit in front of the fireplace with friends or a good book. Hotel offers complimentary self-serve washer and dryers on each floor for your convenience.